Today’s weather vane is an oldie, but definitely a good memory for me. 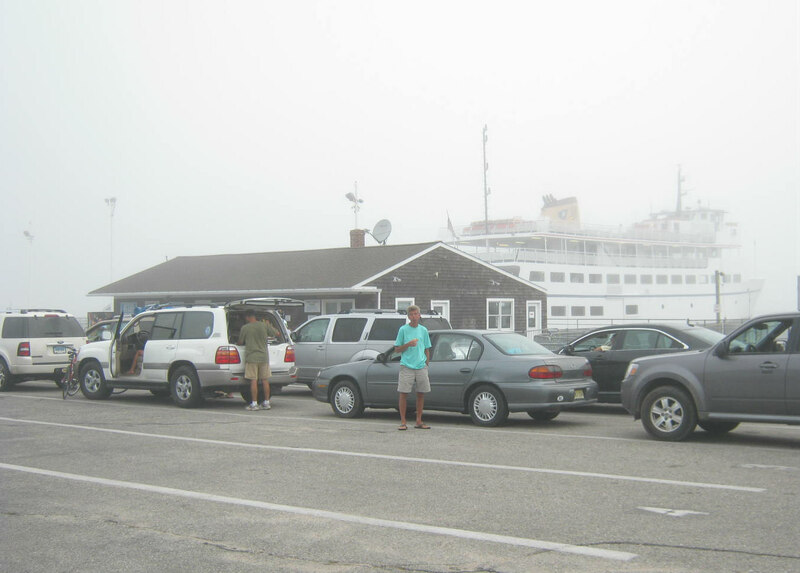 This is early morning on Block Island, Rhode Island, our car in line, my husband waiting to pull it onto the ferry for the ride back to Point Judith. I love the foggy atmosphere. So often, in early morning, when we left the island, the fog would be thick and mysterious. On top of the small house selling tickets is what appears to be some type of weather vane. It surprises me to look at my hundreds of photos of our vacations on Block Island and not find any vanes. Once again, I’m reminded that often you don’t see what you aren’t looking for at the moment. The Photo Challenge: Each Wednesday, I post a photograph of a Weather Vane with a short description of where it can be found and any history connected to it. The main focus of the challenge is the photo of the Weather Vane and the location. The challenge can be Wordless if that is what you choose. If you would like others to see your post leave a link to your blog in the comment box. You can also tag the post #weathervaneweds. If you place a link to my post in your post you will create a pingback that will appear in the comment section. The challenge is open all week for comments and posts. Thanks so much for taking part in my challenge. Many thanks to Cee, of Cee’s Photography, for including this challenge in her listing of WordPress Challenges. If you love challenges take a look at this page and while you are there check out some of Cee’s terrific posts. Thanks Cee! Pheathers – Bird Cams – Eggs and more Eggs! BI is a very special place to me. I instantly recognized it while quickly browsing through my feed. I’ll look for the weather vane when I’m there this summer! I hope it is is still there. While I was searching for a vane in my BI photographs I was so surprised to find nothing. My husband and I wonder if the winter winds get so strong weather vanes would just blow away.